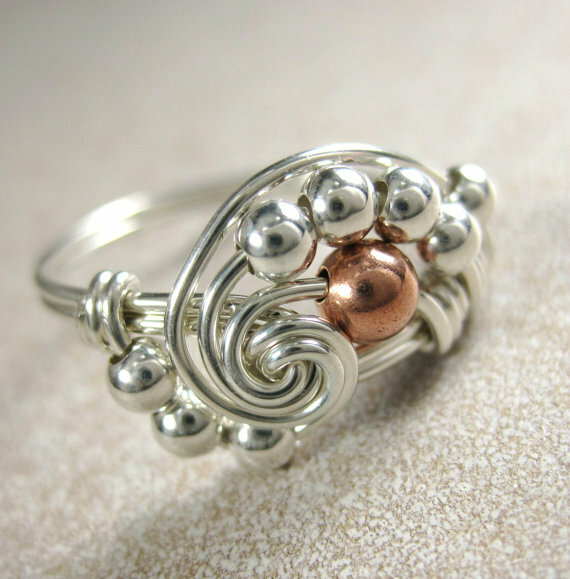 Florida based Holmescraft on Etsy doesn't just make lovely wire wrapped rings. She makes mathematically and science inspired ones using mostly wire and beads. 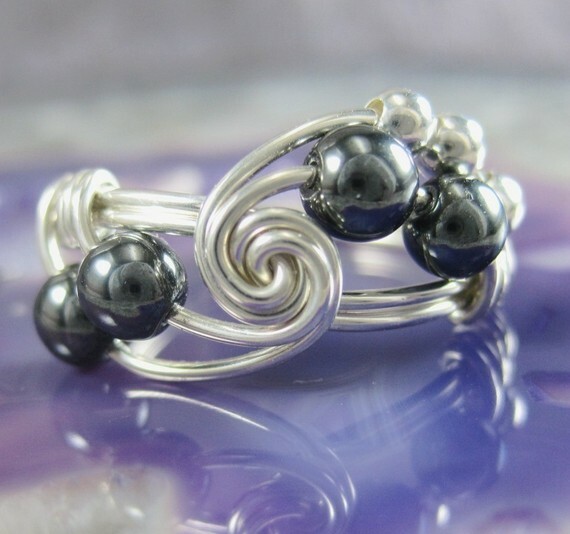 Her hematite and sterling silver ring above celebrates Fibonacci numbers.These are a particular sequence of numbers used in mathematics which starts with 0 and 1, and each subsequent number after that is the sum of the previous two like so : 0,1,1,2,3,5,8,13,21,34,55 and so on. Her ring uses a simple bead pattern : 1,1,2,3. The sequence is named after Leonardo of Pisa who was also called Fibonacci. He introduced it to Western audiences in his book Liber Abaci way back in 1202. The sequence is also observed in nature. Pi as you know is a very important mathematical constant - it's the ratio of a circle's circumference to its diameter. Pi is a never ending number so the ring designs just highlights the first 4 numbers : 3.141. Can you spot them? 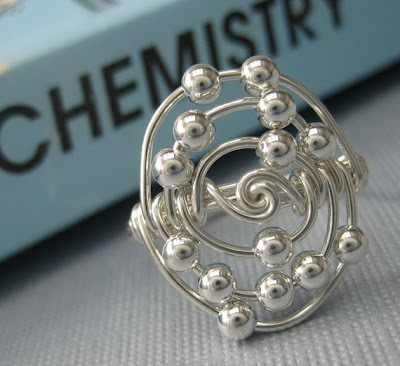 She may have struggled with chemistry in her high school days but she nails it with her atom rings! 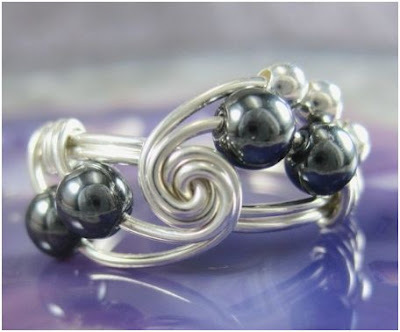 The design below is the silicon atom which has an atomic number of 14 - hence the 14 sterling silver balls! Silicon is the 8th most common element. It mainly exists not in its free form but combined natural materials like in sand and stone. I also love her constellation rings. 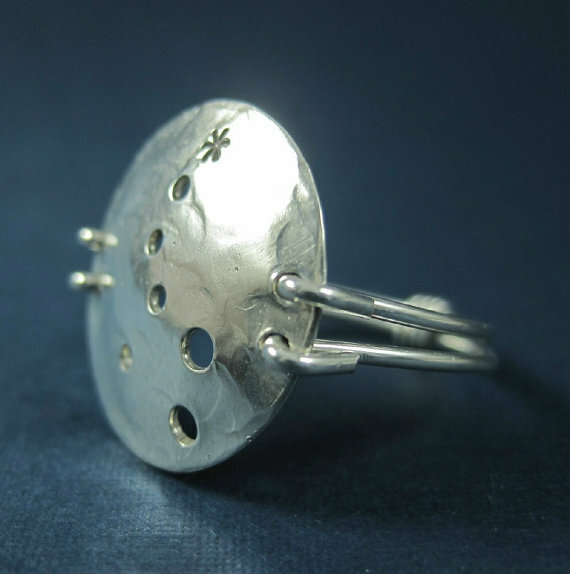 This one was inspired by the Little Dipper which is properly known as Ursa Minor. Polaris or the North star is the one at the end of the handle. She says, "My problem is I don't have just one "drug" of choice. Michael's is a dangerous place! I love doing so many different things. Jewelry and polymer clay, stamping and card making, candle making and bath products, painting and crochet are some of the outlets my creativity takes." Her rings do indeed demonstrate her incredibly creative mind! Beautiful and educational! What more could you want in a design. This is awesome! I love the theme and the artistic interpretations on it. Who would guess I've always hated math of all kinds. I don't care for beaded rings but those first two are so my style.